In many ways this is an album that virtually defines modern day ‘alt. country’ with it’s punked up attitude and atmosphere on songs that whilst not overtly ‘country’ do often have a country edge and sometimes instrumentation. Several of the songs really rock, perhaps better than many out and out rock bands, but there are other songs that dive deeper into country music with the pedal steel guitar weeping it’s way through some lovely ballads, allied to one of the most expressive vocalists in this generic field. It’s just not in their makeup to make ‘mellow’ music with even those ballads having a distinctive raw, perhaps even realistic, edge. The beautifully balanced arrangements and recording consists of ten excellent songs all of which are band ‘originals.’ The emphasis on originals is simply because although many influences, deliberate and accidental, can be discerned, overall there is a tremendous amount of originality in their music which makes outright comparisons to other artists difficult; always a huge plus! American Thread was formed in Boston in 2012 by Brendan Ahern, lead vocals and rhythm guitar and Geoff Downing on drums and were the nucleus of the band that recorded their excellent debut ‘Killing Fields’ in 2013. The pair then got in Michael Taggart (formerly of The Good North) to play lead guitar and his brother Gary handles Bass. To their number has been added Kevin Maher on guitar and pedal steel duties are handled by producer Steve Mayone. All of the excellent and musical, as well as thematically varied, songs were written by Brendan Ahern except for Treat Her Right which was a co write between band members Kevin Maher, Michael Taggart and Brendan Ahern and The Rest Of Me is a cowrite between Ahern and Michael Taggart. Brendan Ahern’s vocals are melodic, evocative and have a raw backwoods feel to them that is perfectly suited to their music as are the band harmonies and the all round playing. Looking back through some notes, ‘realism’ was a thread that I felt ran through this tremendous album and nothing, as yet, has altered that opinion. Even the ballads haven’t been subjected to any ‘sanitisation,’ with the lyrical content in most cases evoking real life situations, keeping that thread of rawness going from start to finish. The album opens with Enjoy The Road, a ‘hard’ tale of a lonely trucker, that is classic alt. country with evocative lead vocal and instrumentation with equal input from fiery electric guitars and a tuneful jangle, on a colourful tale that is at times quite explosive, at others more sedate, but always with a hard atmosphere. Waking Me Up starts with a nice gentle acoustic guitar before the lead vocal that is reminiscent in equal parts of a young Bob Dylan and John Prine amongst a few others, comes in but with a gorgeous steel guitar supporting the lighter bass and percussion on this almost mellow love song. 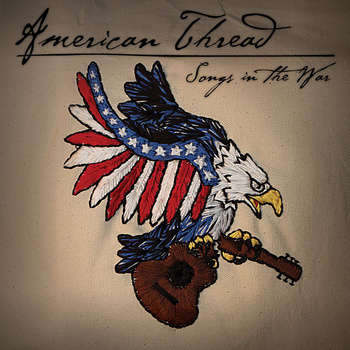 On the title track, Songs In The War, there is just acoustic guitar for support on a patriotic song that has a terrific story, full of realism and with a lead vocal that has a young Dylanesque feel, on a song that is thematically reminiscent of John Prine’s Sam Stone, in as much as the tale is gritty and the main character living in his own wounded world. The Rest Of Me is another song with a nice acoustic guitar intro before being joined by the solid percussion and gorgeous steel guitar. Ahern’s lead vocal perfectly expresses the story of someone who pursues a life as a working musician. The tale is full of a sad realism in which you know that as things progress any improvement is going to be minimal, if very unlikely. Finally Broken Home is propelled by an acoustic and a lovely melodic electric guitar on another sad tale, this time of someone from a ‘broken home’ whose dysfunctional start in life ill prepares him for a ‘normal life,’ veering as he does between dysfuncionality and the quest for an elusive normality. Make no mistake, this is a high quality ‘roots music’ album and band, with their expertise proven over the course of their two recordings. As stated earlier they bring a nice touch of originality to their music which should certainly be filed under ‘alt. country,’ albeit having used a broader canvas than the first wave of generically similar bands used. This is an excellent album that because of the edginess, all round quality, variety and sheer musicality will be played in my house for a very long time!